Hi! My name is Chelsea Graham. I am a Digital Imaging Specialist at the Institute for the Preservation of Cultural Heritage (IPCH) at Yale University. Our institute is situated in the Collections Study Center, a facility where some collections from the Peabody Museum of Natural History, Yale University Art Gallery and Collection of Musical Instruments are housed, conserved, digitized, and studied. Yale holds quite an array of collections from across space, time and subject matter. I manage our institute’s Digitization Lab where I am privileged to work with a variety of materials and digitization techniques! I collaborate with art historians, conservators, conservation scientists, natural history collections experts, computer scientists and Yale faculty to develop projects that enable virtual examination and revolutionize the relationship between viewer, researcher, and data. At Yale, the material I work with runs the gamut from meteorites older than earth to fossils of animals that swam over our continent in the cretaceous period to Disney animation cels! I’ve always had an affinity for the past! After graduating from Hamilton College (’08) with a BA in archaeology, I spent two years working in the collections and archives of the Divisions of Paleontology and Anthropology at the American Museum of Natural History in New York. 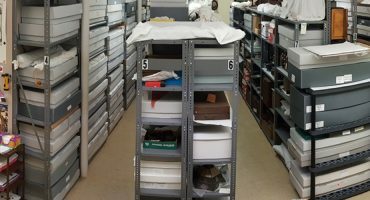 Here I marveled at the many wonders that remain locked in the cabinets and crates of collections storage spaces. Interacting with the knowledgeable, entertaining, and encouraging staff expanded my horizons. You never knew who you might share an elevator ride with and what interesting tidbit or anecdote they might tell about a revered scientist, object or exhibition. Similar to their stewards, I felt collections had the potential to tell engaging stories with important implications. I became dedicated to unlocking their potential to answer social and scientific questions. To work closer to this goal, I enrolled in a master’s program in archaeology at Lunds universitet (’12) in Sweden. Here I was introduced to and pursued coursework in digital archaeology led by Professor Nicolò Dell’Unto and spent time in the field on excavations and historic buildings surveys working with geographic information systems and site specific digitization endeavors. We dug at a nearby Iron-age site, Uppåkra, where the Digital Arkeologi Lab continues to employ 3D digitization and visualization in contextualizing archaeological research. These fun, albeit damp and cold Scandinavian field stints confirmed my preference for object-based museum work to excavation. Although unearthing an artifact while on a dig is an undeniable rush, unlocking cabinets to discover hundreds of years of finds, without the personal investment of blood, sweat and dirt, remains more alluring to me! Therefore, in Lund, I became interested in digitization in a different context. I began tailoring projects to focus on the applications of digitization to museum collections management, research and accessibility. As a part of my Master’s thesis, I fostered a collaboration with the Ny Carlsberg Glyptotek in Copenhagen in order to scan a bust that has been examined for traces of polychromy in the context of the Tracking Colour project. I present the 3D model of this portrait bust as a platform for integration of technical imagery and scientific data for enhanced visualization, interactive exploration, comparative analyses and reconstitution of color. In 2013, I joined IPCH where I work mainly with 3D scanning and computational imaging of art objects, cultural heritage relics and natural history specimens at Yale and in the field to lead and support projects with dynamic documentation, investigation and dissemination objectives. As technology has developed, an exponential increase in the application of new visual technologies has been experienced consistently across the humanities, natural sciences and social sciences. 3D and VR have become an essential component of research, communication and democratization of cultural heritage data— leading specialists to important discoveries, guiding conservation practices, and allowing for collaboration across distances. As they have become more prevalent, methods of visualization have proven central to our understanding of both the material and intangible aspects of cultural heritage. At Yale’s cultural heritage institutions, as with most around the world, such a small percentage of a museum’s collection is on display at a given time. 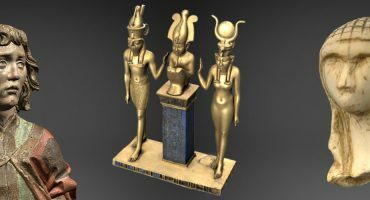 3D digitization plays a big role in how collections are directly applied in research and incorporated in exhibition to engage the public. 3D impacts how we experience and interact with the past whether an object is on display in a gallery, housed in a cabinet or has been re-interred after repatriation. 3D also has the ability to innovate how researchers interact with data as well as how they communicate their results with each other and the public. an interactive exploration of culinary traditions from some of the earliest Akkadian cuneiform cooking tablets. In 2016, Yale received a loan inquiry for Babylonian tablets for an exhibit to be held in the Netherlands. Since the objects in question were so fragile, rare and valuable, the loan was not possible. Instead, I 3D scanned three of the four only known recipe tablets for interactive installation in the 2017 exhibit Ik kook, dus ik ben. or I cook, therefore I am. at Wereldmuseum in Rotterdam. With the 3D data, a collaborative team from Studio Maaike Roozenburg, TU Delft and Zcene Moving Media created the installation ‘The oldest recipes of the world of the beauty of tradition’. In 2018, another interdisciplinary project was formed around these culinary tablets. A team consisting of Yale, Harvard and independent scholars and food experts interpreted and reproduced the world’s oldest culinary recipes for the An Appetite for the Past symposium hosted at New York University in May. Ahead of the event, team members reworked translations with the aid of high-resolution imagery, made parallels to Arabic culinary traditions, and investigated chemical processes that occur during cooking and how they impacted consistency and taste. In terms of 3D data generation, our lab has equipment, facilities and aptitudes to support 3D scanning and photogrammetry. We have hardware for triangulation laser scanning (ShapeGrabber PRM330, NextEngine 2020i), structured light scanning (Artec Space Spider) and photogrammetry (Canon 5D Mark III). Whether undertaken in the lab, a gallery or the field, acquisition is often aided by a range of Manfrotto tripods and a portable OrangeMonkie Foldio light studio and Foldio360 turntable. For processing, both proprietary and open-source software are commonly used (Artec Studio, Agisoft Photoscan, MeshLab, MeshMixer, Rhino, Blender). Analysis, comparison, research and investigation of geometry and texture are often conducted in MeshLab and Blender. The lab also experiments with 3D printing (formlabs Form 2, Dremel 3D20). Scanning mathematical tablets in the Yale Babylonian Collection using an Artec Space Spider. Which method of digitization to pursue depends on many factors including the intended applications of the 3D data and conditions presented by the object to be scanned as well as scanning environment. Some materials with specular, translucent, dark, or uniform textures can create challenges to acquisition and necessitate resourcefulness. A lot of scanners come with powders to remedy these issues, but it is generally not possible to coat our objects in any foreign substances. Understanding how introducing textured backgrounds as well as, altering lighting, angles and settings on your camera or scanner impact acquisition are very important! Another consideration is how much data to collect (how many images or scans to capture). Too little data will yield an incomplete or low resolution model while too much data will result in impossibly long processing times and difficulty sharing your work. It is worth it to spend some time experimenting with digitizing different materials, with different arrangements and settings to familiarize yourself, so that you are ready to conquer acquiring 3D for all sorts of objects. If you are interested in starting out in the realm of digital cultural heritage, dive in! The cost of hardware has fallen and there are lots of free, open-source software options out there. You likely already have the tools necessary to start acquiring 3D in your pocket! Look into some guides, resources and opportunities for free education whether in the form of YouTube tutorials or grant-funded workshops. My understanding of photogrammetry has been supplemented and aided by techniques endorsed by Cultural Heritage Imaging. 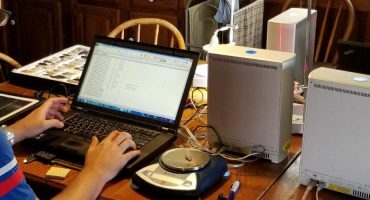 They are a great resource for those hoping to get started in computational forms of imaging cultural heritage. Experiment and start generating some models and share them with your friends and colleagues. No matter your subject matter, mock up your models on Sketchfab with annotations and correlated data to showcase the strengths of 3D to aid in research and tell a story. This will help you to pick up some momentum and get people enthusiastic about embracing 3D as new means of visualizing and interacting with their objects! More and more institutions are adding 3D to their toolkit for investigation and outreach. In the future, it would be great to see web-hosted research platforms to enable collaborators to study, share and organize large amounts of 3D data. I think these kinds of resources would do much to cultivate a climate of diffusion and further the field of digital cultural heritage. Hopefully soon virtual collections will also become commonplace, making objects accessible to anyone with an internet connection, no matter their distance. Sketchfab is helping to make 3D more accessible and possible to incorporate into teaching and learning objectives. It is exciting to think of 3D models and prints playing a palpable role not only in exhibits, but also in classrooms! It’s hard to narrow it down with so many users generating great content! Archaeological sites and quirky artifacts are the models I am most likely to explore! I’m drawn to Matthew Brennan’s model Painted Female Head both because I am enamored by what the Virtual World Heritage Lab led by Dr. Bernard Frischer at Indiana University has accomplished (and is currently making accessible on Sketchfab in collaboration with the Uffizi Galleries) and because this bust exhibits a great deal of pigment. A colleague from the Yale University Art Gallery and I are currently working on 3D digital color interpretations for two objects from antiquity! Many of the Swedish National Maritime Museums’ models transport the viewer to underwater shipwrecks. The curated view of the ill-fated Vasa, the upper gun deck is my favorite model of theirs!